I've been reading GapingVoid for a few months now. Hugh has some very interesting insights, and draws great cartoons, though some of them are not safe for work. Yesterday, he wrote a post titled Make your customers the marketing department, with the cartoon that I've included above. The post has some good points in it, but I'm more interested in the message in the cartoon. I've seen lots of examples at Microsoft where teams have become enamoured with technology, while not connecting with customers. Customers are betting their livelihood on your software. 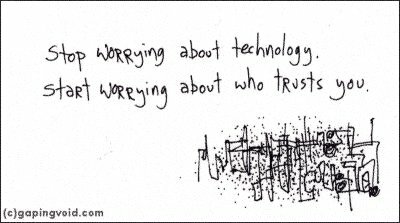 If they don't trust you, it doesn't matter what your techology is, though it's a pretty fair bet that if you haven't been talking with customers, what you build will not be a good fit for their needs. How should you talk with your customers? That’s what your post caused me to think about. I am thinking you should regularly survey your customers. Its not too hard to do that nowadays either with an online survey or a telephone call. The questions should have a direction though, the purpose being to find out the needs of the customer and translate those needs into future products. There is also something missing maybe the question should be, now that I have learnt about my customer’s problems, how does my technology help them to solve their problems. I often find technologists can come up with ready solutions if only they do chat with their customers. I’ve watched lots of videos from Channel 9, and the underlying theme is that these employees _do_ concern themselves with what their customers want and they _do_ care about making the best product for their customers. Simply because <insert-your-favorite-feature-here> did not make it into a product does not mean they aren’t listening to customers. In fact, read http://blogs.msdn.com/cyrusn/archive/2005/05/07/415358.aspx. Two MS employees coded up something suggested by a customer and will be pushing to include it in the next version of Visual Studio. As the context of the conversation is VS2005, that would be the version after the *next* version.